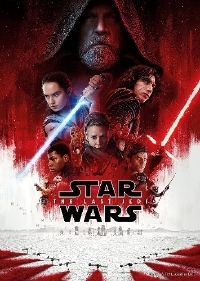 Rian Johnson's Star Wars: The Last Jedi is out on DVD and Blu-ray today. If you haven't already picked up the digital copy that was released a couple weeks back, this is your chance to take home the film that sparked what could be the largest nerd debate in recent years. One thing I didn't expect from Rian Johnson was to deliver such a divisive film, but here we are. Personally, I liked many of the decisions made in The Last Jedi and respect that it attempted to take the archetypes into some new territory. This edition comes with a ton of special features including the documentary "The Director and the Jedi" which promises to be a better inside look at the process of making the film than the not-so-great stuff we got on the Force Awakens / Rogue one releases. We actually get a commentary on this one, which is a bonus. From Shout! comes this steelbook of John Carpenter's Assault on Precinct 13. Shout! releases a steebook blu-ray of the Carpenter classic. The entire first season 32 Episodes You hold in your hands an artifact from a time now vanished forever; a compendium of portals into worlds unknown. A seven-disc set that controls over 27 hours of transmission from the 1963-1964 series, this vessel has sought you out for one specific purpose: to expand your mind to The Outer Limits! Detective Avery (Bruce Willis) uncovers a human-trafficking syndicate and fights the corrupt bureaucracy that has been protecting it. Nathan Baesel (Invasion) stars as Vernon, a good-natured killing machine who invites a documentary film crew to follow him as he reminisces with his murder mentor (Scott Wilson, The Walking Dead), evades his psychiatrist/nemesis (Robert Englund, A Nightmare On Elm Street), deconstructs Freudian symbolism, and meticulously plots his upcoming slaughter spree. But when the actual carnage begins, where do you draw the line between voyeuristic thrills, mythic evil, and good old-fashioned slasher movie mayhem? Angela Goethals (24) and Zelda Rubinstein (Poltergeist) co-star in this ingeniously twisted and award-winning shocker. An "infection" in the past has caused automated systems to spiral out of order, resulting in a multi-leveled city structure that replicates itself infinitely in all directions. Now humanity has lost access to the city's controls, and is hunted down and purged by the defense system known as the Safeguard. Over the past five years, Vinegar Syndrome have worked to find, restore, and re-issue some of the most eclectic, unique, and unjustly forgotten genre films from the greatest era for independent cinema, the 1960s through 80s. While their focus is always on preservation (All their restorations are archived in either 2k or 4k, depending on how the film was scanned), on some titles we couldn't justify the expense of Blu-ray and as such, only DVD editions were issued. However, to celebrate their fifth anniversary, they've assembled this limited edition 2-disc Blu-ray collection of five previously DVD only Horror and Exploitation rarities, spanning the wide reaches of their archive. This set is limited to 2,500 units. THE MUTHERS: One man exploitation filmmaking machine Cirio Santiago's high octane and female led action classic, THE MUTHERS, chronicles a dangerous attempt to rescue an inmate from a brutal all-female prison. FLESH & BULLETS: A confusing film from a confusing filmography, Carlos Tobalina's bizarre 80s updating of STRANGERS ON A TRAIN, features the likes of Yvonne DeCarlo and Cesar Romero acting along side Mai Lin! HANG UP: Unsung auteur, John Hayes' masterpiece of misery follows the sad life of a lonely vice cop who begins an illicit affair with a beautiful prostitute, only to discover that she's underage, sending him into a downward spiral of corruption and violence. MURDER ON THE EMERALD SEAS: The directorial debut of Alan Ormsby, this oddball murder murder mystery focuses on a series of mysterious deaths surrounding a beauty patent, promoting the lead detective to go undercover to investigate...in drag! Follow Quiet Earth on Instagram, Twitter or Facebook.